Sepsis is the leading cause of mortality in the intensive care unit (ICU). 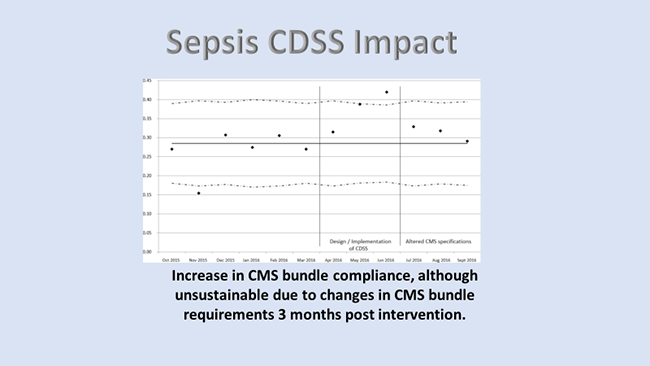 Our severe sepsis clinical decision support system (CDSS) is designed to identify patients with severe sepsis and help the clinician implement a consensus bundle of standardized, evidence-based interventions within a narrow therapeutic time window. The main aim of this project is to improve the sepsis bundle compliance rate and reduce mortality. Torsades de pointes (TdP) is a highly lethal form of ventricular tachycardia that is most often related to medication induced QT-prolongation on the electrocardiogram. 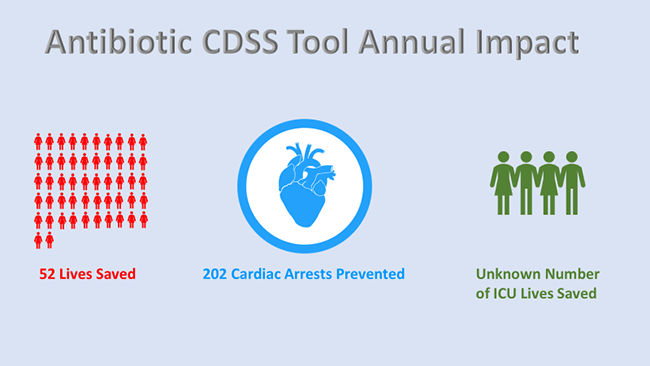 The antibiotic CDSS is designed to identify patients who are prescribed antibiotics that put them at risk for cardiac arrhythmia and make recommendations for evidence-based interventions to reduce that risk. Additional classes of medications will be added once the antibiotic CDSS is active. 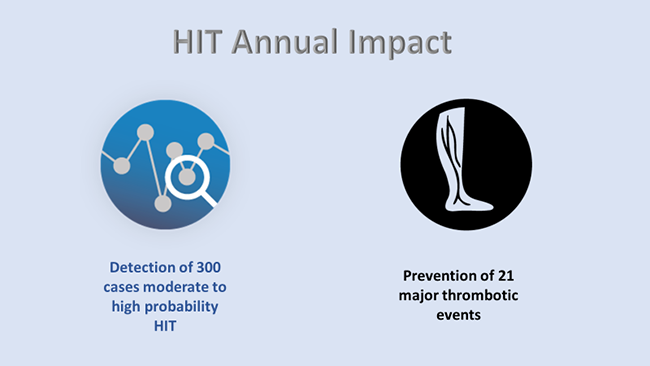 Heparin-induced thrombocytopenia (HIT) is an immune-mediated adverse event that causes thrombotic complications, including pulmonary embolism, stroke and limb gangrene. The HIT CDSS is designed to detect patients early in their clinical course and to help clinicians make standardized evidence-based diagnostic and therapeutic decisions. The specific aim of this project is to support management decisions to improve clinical outcomes by improving the safe use of heparin. 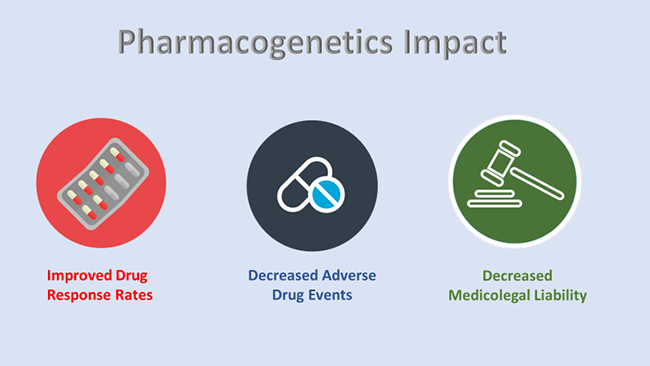 Clinical pharmacogenetics is the use of genetic testing to guide therapeutic decisions for optimal clinical response and to prevent adverse drug events by recognizing genetic characteristics that can influence the patient’s response to medications. Personalized or precision medicine through use of clinical pharmacogenetics provides the opportunity to optimize benefit-risk profiles, so the right patient gets the right medication at the correct dose. Developing projects will integrate clinical and genetic data into CDSS that result in better health outcomes. Acute respiratory distress syndrome (ARDS) is a major cause of death in critically ill patients. It is a life-threatening condition that prevents oxygen from passing through the lung tissue into the blood. The ARDS CDSS that provide surveillance and early diagnosis of ARDS in patients in order to identify opportunities to standardize and improve care. 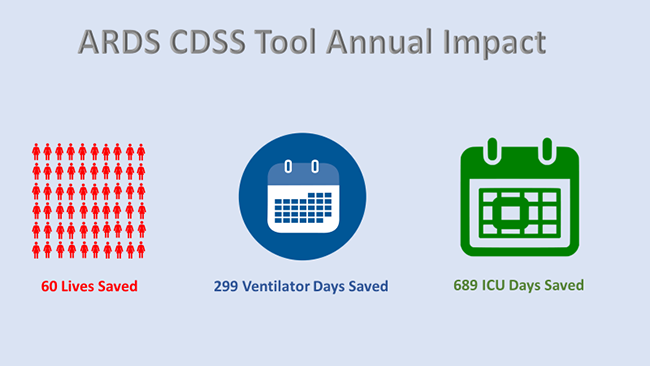 The CDSS will identify patients who require mechanical ventilation, changes in their ventilator settings and those who require advanced levels of care in an Extracorporeal Mechanical Oxygenation (ECMO) center.